Yesterday’s strip brought in a TON of traffic. Thanks to those of you who submitted it to various bookmarking sites. Apparently pink probulators are the in thing. This is a game show I think everyone could get into. I would totally be in the studio audience for this game. Pick the door on the right! 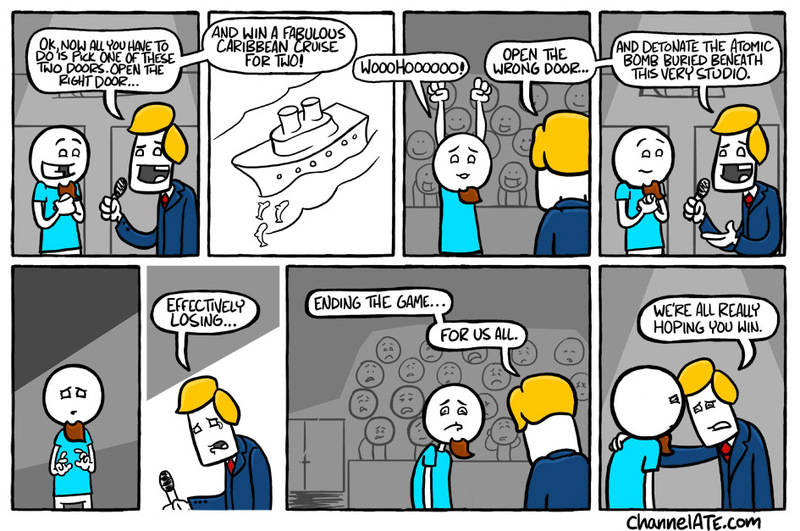 He said the right door wins a cruise! Now, was it your right or his? Gotta think about that one before you blow us all to hell. “Blow us all to hell.” When I read that It took me a little while to stop laughing. This is a great comic strip! I discovered it today and i went through all of them. It was a great way to procrastinate at work! Glad I could help you kill some time! Oh Yeah, you gotta keep busy. man i wish all studio shows were like that! Thanks to this comic I’ve “The Game’d” the whole workplace and they hate me for it 🙂 Thanks Ryan! Who would’ve thought that their fate would end up in the hands of the Ukulele-stoner-gardener who doesn’t pay child support. 4fbkhF Loving the info on this site, you have done outstanding job on the blog posts. J6q0rt Thankyou for this post, I am a big big fan of this website would like to proceed updated.